The Haynau plaque on Park Street. See below. Image public domain. With New York currently entertaining us with tales of a mayoral candidate’s interesting peccadilloes (we know the feeling), it’s time to remind the world that anything they can do, we can do better. Here we investigate London’s top scandals, from the well known to the well forgotten. When a young girl named Aline, daughter of the baronet Sir Henry de Hoghton, surprised her family by having a daughter in Milan in 1874, the culprit was swiftly identified as Alfred Aurelius Clark, a notable member of London's high society. What followed was remarkable by the standards of the age: Clark refused to marry Aline, instead taking his daughter to London where he posed as her 'guardian'. Clark married another woman, and the couple brought up the girl in typically upper-class fashion. Then Clark's wife died in 1890. The following year Clark married his daughter in a church in London's Strand district, and in 1892 a child was delivered of the couple. The unhappy girl at the centre of the affair subsequently found out she was her own husband's daughter, and by all accounts was 'nearly deprived of her reason' by the discovery. Clark maintained he was only the girl's guardian, not her father, but eventually fled England in disgrace. The king of all scandals: Richard John Bingham, 7th Earl of Lucan, bludgeons the family nanny to death at 46 Lower Belgrave Street, tries to do the same to his wife, before legging it to lands unknown. The interest in the man will seemingly never die away: a new ITV drama about the fateful night is imminent. Julius Jacob von Haynau was one of the more regrettable participants in the Hungarian Revolution of 1848. His tactics during the conflict included particularly brutal acts against Hungarian women, which somewhat displeased the honourable gents of London when news filtered from the continent. 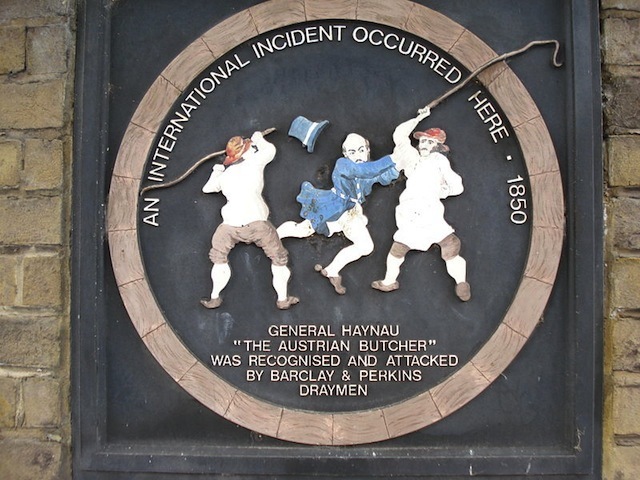 Two years later during a visit to a London brewery, the usually respected von Haynau was set upon by Southwark draymen, who according to the gleeful reports in subsequent newspapers was given a proper shoeing by the angry beer-men. As von Haynau hid in a nearby inn it would be fair to assume a few elbows were bent in the brewery that evening. A plaque on Park Street remembers the incident. The disappearance of 19 Cleveland Street is not a scandal in itself, but what took place within the building at that address that caused it to be quietly removed from the Land Registry certainly was. In the summer of 1889, a 15-year-old named Charles Swinscow, when quizzed by a beat copper about why he had a huge amount of money on him, revealed he had been paid for favours by numerous gentlemen inside number 19. Scotland Yard put the house under surveillance; visitors included Lord Arthur Somerset, the Earl of Euston and a Colonel from Winchester. The press got wind, and it wasn't long before the scandal became a royal one as Prince Albert Victor, grandson of the Queen and second in line to the throne, was named as a possible client of young Swinscow. Some of the accused fled, others were tried and convicted of 'procurement', but another form of justice befell the Prince, who died in the influenza pandemic of 1892. The Profumo Affair looks almost quaint with the benefit of 50 years' hindsight. John Profumo, the Secretary of State for War, began an affair with model Christine Keeler in 1961 before being rumbled a couple of years later. There are affairs and affairs in British politics of course, but since Keeler was also receiving intimate attention from Yevgeni Ivanov, a senior attaché in the Soviet Embassy, the security considerations in the middle of the Cold War forced Profumo out of politics. Given no security breach was ever officially discovered, it should be noted that Profumo went on to work quietly but tirelessly for a charity in Spitalfields, an unsung hero of the East End for nearly 40 years after the affair. Sir Richard Worsley was an English politician and nobleman who married Seymour Fleming, daughter of another noble family, in 1775. The couple were not greatly suited to each other, and Seymour duly embarked on a string of affairs. Among her suitors was George Bisset, a captain in the South Hampshire militia, who subsequently got the lady pregnant. Sir Richard accepted the child as his own, but when Seymour and George scarpered together to London it seems the unfortunate cuckold snapped — rather than agreeing to divorce, he elected instead to sue Bisset for the massive sum of £20,000. Sadly it seems Sir Richard had reasoned without the intervention of Mary Marriott, who worked at the baths of the Coxheath military installation where Bisset's militia was based. Marriott testified that, far from being shamed by the antics of Bisset and his wife, Sir Richard had in fact facilitated it, to the extent that he once propped Bisset up on his shoulders so he could get an eyeful of Seymour in the changing rooms of said baths. Sir Richard ultimately won the case but was awarded just one shilling in damages, while the papers had a whale at his expense. The story of Michael Fagan is well known — he wandered the halls of Buckingham Palace in 1982 before eventually finding the queen's bedroom and causing all manner of panic. But Fagan had a lesser-known forerunner: Edward Jones, a craftier and more daring intruder. In 1838, Jones entered the big house disguised as a chimney sweep, before being caught thieving a few items of Queen Victoria's underwear. Somehow acquitted at trial, a year later Jones was back in the Palace, first breaking in and leaving undetected before going inside again, only to be caught by a servant under a sofa in the Queen's dressing room. The papers quickly dubbed the youngster 'the boy Jones'. After three months' hard labour, his final attempt in 1841 finally persuaded the government to increase security around the Palace, though apparently not enough to stop Mr Fagan's seemingly innocent stroll nearly a century and a half later. One of the unfortunate souls brought into the orbit of the Kray twins was Baron Robert Boothby, MP for East Aberdeenshire. The bisexual Boothby was introduced to Ronnie Kray in 1963 by a croupier and cat burglar Boothby had been having an affair with, which rather sums up the Baron's questionable decision-making given his position in the public eye. Kray supplied Boothby with young men and arranged what we might now call Berlusconi parties, but the real scandal came when the papers got wind of it. With politicians of all hues caught up in the scandal, including Labour's Tom Driberg, the parties put pressure on the papers not to publish, and Scotland Yard all but refused to investigate. Threats from the Krays and their acolytes complicated matters further for publishers. The almighty cover-up remains one of the more unedifying events within the politics of the past century. In 1973, when Lord Privy Seal and Leader of the House of Lords George Jellicoe admitted to the odd tryst with call girls in his past, little did he know he would soon be caught up in a bigger scandal based solely on his surname. Lord Antony Lambton, a Tory MP and cousin of former Prime Minister Sir Alec Douglas-Home, had been having his wicked way with a prostitute named Norma Levy, in a Somers Town building called, somewhat unfortunately, Jellicoe House. Some leaked photographs of Lambton and the addition of a drugs angle to the story led to an official investigation. Somehow that investigation confused the Jellicoe building with the Jellicoe man, and despite protestations of innocence it was all over for poor George. A subsequent Commission concluded Jellicoe had nothing at all to do with Lambton and that it was all down to 'misfortune' that he had admitted to his use of call girls when he had. Most of the best scandals of the Cold War involve a bit of spying, and John Stonehouse was possibly the cream of the crop. While outwardly doing a standard ministerial job as first Postmaster General and then Minister of Posts and Telecommunications, Stonehouse had by 1970 been spying for Czechoslovakia for eight years. In 1974, with business interests crumbling and the Department of Trade and Industry poking around, Stonehouse left his clothes on a Miami beach and seemingly did the full Reggie Perrin. He had in fact had it away on his toes, first to Australia, then to Copenhagen, then eventually back to London in the custody of her Majesty's constabulary. He subsequently served seven years for fraud — his spying did not come to light until the 1980s when it was hushed up by the government, who presumably couldn't see the point in further revelations.